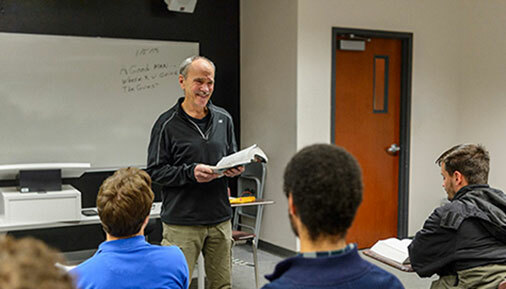 This year, one Hudson Valley professor marked a milestone that no faculty member before him can claim: English professor James Slattery has taught at Hudson Valley for 50 years. His accomplishment was recognized at the college's annual Meritorious Service Awards on Dec. 8, where he became the first and only college employee to receive a 50-year pin. When he took to the stage to accept that pin, his one simple remark said it all: "Thank you. I truly love Hudson Valley." Like many great love stories, this one began almost by accident. When Professor Slattery joined the Hudson Valley faculty in 1967, he was just out of college and teaching high school in Schoharie. While he was working on his master's degree, a friend suggested he try teaching college. He was skeptical, unsure of whether he wanted or was suited to the task. But ultimately, he decided to give Hudson Valley a shot—and the rest is history. Professor Slattery has been teaching English classes at the college ever since. Technically, he retired from his full-time teaching position in December of 2000, but it was hardly a break—he returned as a part-time faculty member in January 2001. He currently teaches public speaking, creative writing, and short story classes, and has no plans to slow down anytime soon. After all this time, a Hudson Valley classroom is still his favorite place to be. "Teaching is, for me, a gift," he explains. "There's nothing more rewarding to me than influencing students' lives." Professor Slattery says he's been lucky to be able to hear generations of those students' stories in his classroom. "I'm fortunate to be able to have the interaction with students as individual human beings—not just people who happen to be sitting in front of me at desks," he explains. Some have hidden talents that he thrives on helping bring to light. Others tell heartfelt stories in class that they might not share anywhere else, providing a rare glimpse into their internal worlds. But while the details may differ, and the times have changed, he says that at the heart of it, the students and their stories remain mostly the same. "In the sixties and seventies, we had anti-war protests, the civil rights movement, all the culture changes - the Vietnam veterans coming home, and the impact that had. And I heard all those stories in class. And now, I have veterans from the wars in Iraq and Afghanistan, and we're seeing protests and talking about equal rights," he says. "The times change - the clothes change, the trends and styles change, but at heart, a lot of it is the same. They're the stories of America. They're the stories of Hudson Valley. They're the stories of students who, whether they had some traumatic event happen or if they're just "normal;" they come here and they get to start a new life." Another thing that hasn't changed? The spirit of Hudson Valley - and what it's meant to him to be a part of the family here for so long. He says that he met some of his best friends and the most important people in his life at Hudson Valley. Even his wife, Pam, is a fellow Hudson Valley faculty member, in the Nursing department. "This place has kept me real," he confides. "That's one reason I love it so much. Life is not about the view from some ivory tower, and because I was here, I never lost touch. And the other thing I love about Hudson Valley is that I met so many people who became so important to me here. From students to co-workers to custodians—Hudson Valley is a family, and like family, they take care of you." Professor Slattery's educational philosophy is simple—and it might be more of a life philosophy, which is fitting coming from a person for whom teaching and life are so closely intertwined. "I believe in education," he says. "By that I mean, I believe that your education will continue whether you like it or not, because life is full of constant change. The question is, how do I become more? You need to be able to open your mind to other parts of life, and if it comes to you that there's something you want to do, and it's logical, possible, and worthwhile, then just do it." So what's next? Sure, he's got a few vacations he'd like to take, but nothing that would cause him to stop teaching entirely, a scenario he says is difficult for him to imagine. "I'll keep doing this until I can't anymore," he says. What's keeping him interested in this career, long past the point that many people retire? For one, it's the students, who he says he's eternally grateful to. "Those students are the reason we're here," he points out. "Without them, none of us would have a reason to keep doing this." But there's a more philosophical reason, too. He refers to a question posed by his favorite author, Leo Tolstoy, in his novella "The Death of Ivan Ilych"—one of the first pieces Professor Slattery taught to his early English classes at the college. "In the book, the question you get to is, 'What gives your life meaning?' For me, that's teaching here. I get to have a positive effect on other people every single day. That's the key to meaning in my life."